Melville House HybridBooks combine print and digital media into an enhanced reading experience by including with each title additional curated material called Illuminations — maps, photographs, illustrations, and further writing about the author and the book. The Melville House Illuminations are free with the purchase of any title in the HybridBook series, no matter the format. Before WWII , German writer Hans Fallada’s novels were international bestsellers, on a par with those of his countrymen Thomas Mann and Herman Hesse. In America, Hollywood even turned his first big novel, Little Man, What Now? into a major motion picture. Learning the movie was made by a Jewish producer, however, Hitler decreed Fallada’s work could no longer be sold outside Germany, and the rising Nazis began to pay him closer attention. When he refused to join the Nazi party he was arrested by the Gestapo—who eventually released him, but thereafter regularly summoned him for “discussions” of his work. However, unlike Mann, Hesse, and others, Fallada refused to flee to safety, even when his British publisher, George Putnam, sent a private boat to rescue him. The pressure took its toll on Fallada, and he resorted increasingly to drugs and alcohol for relief. After Goebbels ordered him to write an anti-Semitic novel, he snapped and found himself imprisoned in an asylum for the “criminally insane”—considered a death sentence under Nazi rule. To forestall the inevitable, he pretended to write the assignment for Goebbels, while actually composing three encrypted books—including his tour de force novel The Drinker—in such dense code that they were not deciphered until long after his death. Fallada outlasted the Reich and was freed at war’s end. But he was a shattered man. To help him recover by putting him to work, Fallada’s publisher gave him the Gestapo file of a simple, working-class couple who had resisted the Nazis. 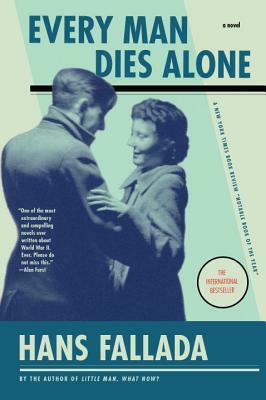 Inspired, Fallada completed Every Man Dies Alone in just twenty-four days. He died in February 1947, just weeks before the book’s publication.